In January 2018, the Greg Secker Foundation, the charitable organisation that Learn to Trade actively supports, officially handed over 100 houses and rehomed over 500 people within a village in Lemery the Philippines, following the devastation of Typhoon Haiyan in 2013. We spoke to Sammy Schwind, Head of Communications and Engagement, at the Greg Secker Foundation to find out what has happened since the village opened and the work the Foundation is continuing to do there. Why did the Greg Secker Foundation build a village in Lemery? After Typhoon Haiyan hit the Philippines in 2013, thousands of peoples homes and livelihoods were destroyed and they were living in temporary and unsafe shelters. In 2015, Greg visited Lemery in the Philippines and was shocked to see that people were still living in terrible unsafe conditions. He wanted to do more to help this community, so Rosario, Greg’s housekeeper and whose family live in the region, arranged for Greg to visit the site that would go on to become the Greg Secker Foundation Village. It was then that Greg decided that he would have 100 homes built for the victims of the Typhoon. The Village took just over two years to build, and during that time we saw some pretty extreme weather, but in January 2018 the homes were finally handed over to the beneficiaries. Greg, his family, friends and employees from Learn to Trade, flew in from all over the world to be part of the handing over ceremony. How did you open the village? It was an incredibly emotional few days for everyone involved, the Foundation team, Learn to Trade employees, Greg’s friends and family and the beneficiaries themselves. There was a lot of hugging and crying with relief, as the families entered the houses for the first time. They could not believe that these houses were now theirs and they would finally be safe again. We spoke to a few of the parents (with a translator) and over and over again they spoke about how they wanted to feel safe and secure and protect their children. They could not believe that now their dreams had come true. They spoke of the night of the Typhoon and how it affected them – destroying their homes and leaving a scar not only on the land, but also, in their memory. One mother spoke through tears, of the noise of the wind and the terror she felt trying to protect her young children in any way she could. Her house was made of wood and sheets of tin, and her husband was away at work, she had no way of knowing if he would survive the Typhoon, she was alone and absolutely terrified. She spent the night huddled with her children under her and the next morning woke to utter devastation. What has happened since the opening? Six months on and the village is thriving. Sustainability for the village has been our main focus, making sure that the beneficiaries thrive in the future. We recently employed Ric and Hope Patricio as sustainability and livelihood advisors and consultants. They both have extensive knowledge and experience in soil and horticulture sciences and in the world food programme. Together with their wealth of experience and knowledge, they are teaching the beneficiaries how to grow produce in the village for their own use with the land that they have available. We have also introduced water tanks in the village, with every household now having their own, and with the help of Ric Patricio, bought in a sanitization plant into the village, so everyone now has clean drinking water. Many houses and families grow their own vegetables and plants, and many are already beginning to harvest the fruits. Absolutely nothing in the village goes to waste – even the vegetables are grown in recycled bottles, cans and car tyres. They have also started growing the moringa plant, often referred to as the miracle tree, it has many health benefits and can be used as a vitamin supplement and is amazing for cuts and burns too. We’re looking at ways to further expand the production of this plant. We heard that a new market has opened in the village? 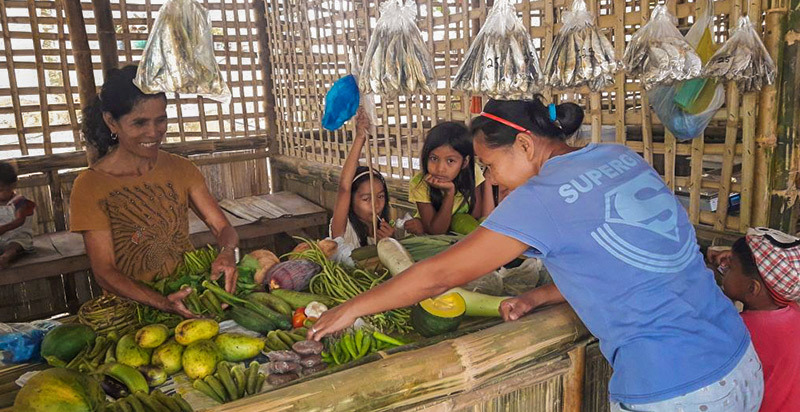 Yes, the village recently opened its own Talipapa Market, where people have opened up stalls selling meat, fish, vegetables, eggs, charcoal and wood, clothing, accessories and more. There is also a small eatery on site where visitors to the market can stop and have a refreshment of batchoy (a noodle soup made with pork offal, crushed pork cracklings, chicken stock, beef loin and round noodles), a coffee shop and a barber too. Since its opening we have seen people visiting from surrounding communities every day, which is a great source of income for our families. We heard that you have bought a community bus for the village? Many people work outside the village and some of these people have faced challenges getting to and from work. We were delighted to have recently received a donation from Benbert Mecarsos Beniero who attended a Learn to Trade Unlimited Wealth event in Manila, and during the evening generously donated money for a community bus. This bus will help families who work outside of the village and also take children to school in Lemery. What is life really like in the village? Every day we see so many social activities happening in the village. We have had weddings, christenings and new babies. It is a close community, and they regularly socialise together such as watching movies on a Wednesday night or Zumba classes on a Friday night. Recently we had a Summer Olympics, with teams of basketball and volleyball competing against each other and even a chess tournament. We have a school close to the village for children in kindergarten up to age 10, and we have seen those than attend really excel there. We also have a literacy programme in place in the village for the mothers too, which is an alternative learning system. With many mothers in the village having stopped education at primary level, this offers them opportunities to learn and get diplomas in Maths, English and Science. We have also run seminars in the village covering health and safety, fire protection, medical missions and waste management to ensure that the families all have the knowledge needed to live in this community. This is particularly important as many of the families previously lived remotely, with no close neighbours before coming to the village. Stay tuned – over the next six months we will see the village really thrive as the sustainability and livelihood farming projects take hold. Already a lot has happened, but this is just the start of their future. It has been very rewarding for everyone involved with the Foundation, whether as an employee, a volunteer or a donor – we are all making a difference to a community that really deserve a second chance. Learn to Trade actively raises money for and donates 15% of all pre tax profits to The Greg Secker Foundation. The charity is committed to positively improving the quality of life of people around the world and enabling people to reach their full potential, thereby transforming their lives and ultimately that of their community. « Previous Post 6 Months into 2018 – Where Are You Financially?